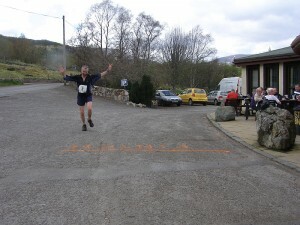 So who could describe a 55 mile trail run as ‘an attractive-sounding short ultra’ and how attractive (or short!) might that still be sounding when you’re standing on the start line seven months later? Now, this was supposed to be some kind of glorified training run and an 11 hour race might have been the perfect tune-up/tester for the West Highland Way, but something a bit faster (to see what I could do) was always going to be tempting so long as it was built on even effort/pace and not salvaged (or otherwise) from early misjudgement. So off I set with the heart rate alarm set to 125 bpm, constantly telling me to slow down despite quickly finding myself near the back of the 45-strong field and possibly irritating me even more than those round about me as they kept passing me, falling behind again or simply tagging along when all I wanted was to find my own space to run my own race. But imposing a set upper limit was probably unnecessarily strict when I knew 130 bpm on the climbs should be fine, and that nagging alarm eventually got turned off at just past one-quarter-distance with group sanity and battery life in mind and half an eye on the heart rate deemed good enough to monitor my continuing effort levels. So that was that, but how about the other potentially crucial factor of refuelling strategy? How to get your drop bags right when you know you’ll never be able to take on what you should for a ‘5,000 calorie race’ but feel compelled to pack it anyway? Just think on the hoof, skip that first bag at Kirkton of Glenisla when collecting/stashing the stuff can only hold you up and you’ve got another waiting a mere 11 miles on at Den of Alyth! So I declined the bag, shot past the checkpoint and quite a few runners as I just kept chugging up the hill beyond (where I finally turned off the heart rate alarm), and might add that comparing my official split placings (30th equal, 27th, 13th equal, 9th, 9th and 8th at successive checkpoints) to my own Forerunner data (c.4:48 for the predominantly ‘downhill’ first half and 5:03 for the more obviously ‘uphill’ return to Glenshee) appears to support the supposition that I ran more evenly than most. But perhaps I’m digressing here, and should just be telling you how nice it was to catch up (pun intended after some good chat!) with John Kynaston over Hill of Alyth before collecting ladies’ winner Helen Johnson and a cramping Bill Hutchison at the Den of Alyth checkpoint to make a sociable gang of four which lasted until walking sociably up the long but runnable climb spanning the halfway point became too much for me to bear with the possibility of finishing in under 10 hours increasingly exercising my mind! So what else can I say when I meant to get this out last night as a concise and readable little report, but have found wrestling with the words to keep it that way less successful than (and maybe almost as arduous as!) the race I’m attempting to describe? I placed 8th in the official time of 9:51:40, with only the first three of Jack Brown (7:54:24), Paul Hart (8:23:17) and Richie Cunningham (8:44:08) more than an hour quicker. My Forerunner recorded 54.59 miles in 9:51:48 at an average pace of 10:50 per mile (5.5 mph) and heart rate of 122 bpm. I beat all the girls (something that doesn’t happen very often! ), but have to be just as happy with running over 2 mins/mile faster than WHW target pace and not suffering for too long afterwards (walking on Sunday and back running comfortably on my normal, rough trails tonight). The organisation by Karen D and team was superb (likewise hospitality by Spittal of Glenshee Hotel), and the finishers’ quaich is a great little keepsake. My soles escaped without blistering (first time unscathed from 50 miles?). My soft-strap heart rate monitor seems to be working much more reliably after tightening the strap and applying gel to the electrodes. Having come back to bottles from Platypus/Camelbak-type arrangements but needing quick access to drinks because I hate running with my hands full, I’ve just been researching bottle belts and ordered the only one that looks adequate to me (Nathan Elite 2V Plus). While still not totally happy with my weight (hovering about half a stone above my initial WHW target), it’s clearly not hurting me that much and I’m no longer set on meeting that target if I can’t get there quickly without running hungry all the time. Congratulations again on a great run on Saturday. A very solid race which will give you lots of confidence for the big one. I enjoyed the few miles we shared together in the middle before you shot off to grab your sub 10hr time. BTW – how did your garmin manage battery wise? See you in just over four weeks when our ‘battle’ will resume!?! That was your race strategy well executed. Starting from the back and finishing at the front (easily in the top 10). It is looking good for the WHW Race I would say and since you are targeting the 20 hours region I am very excited to witnessing another (well I did not really withness the first one but I read about it) intersting battle with John Kynaston in just about 4 weeks! Will you evertake him again over the Larigmor? Well done on finishing 8th and a perfectly executed race too. Looking forward to seeing how it all goes in 4 weeks time. About the Garmin 310XT. I have it and think it is fab but the HRM is giving me loads of issues. Have you found the gel beneficial? Where did you buy the gel? well ran that man; you always looked comfortable – even when we tould you you had reached Pitlochry! Re. gel, search Amazon for Lectron II sold by Body Clock. I got 2 x 250ml tubes because that looked the optimum balance between goods and shipping costs for a sensible amount, but they do all sorts of quantities. As you probably know, I wasn’t happy with the soft-strap HRM either and on the verge of going back to the one that came with my 305, but it’s looking better now. Tightened up the strap a bit, tested the gel on a couple of short runs last week, then committed to it for the Cateran. Decanted some gel into a little canister in case I needed a top-up during the race, but found the readings stayed reliable right to the end despite little or no visible gel being left. So of course your mileage may vary (and I’ll definitely be leaving some gel with my WHW support crew), but I’m more or less convinced right now.